This recipe is from Eggs on Sunday, but I only made the cookies. These were okay, but not perfect. I didn’t get grade B syrup, so one problem could be that my syrup was too light. They also spread out much more than I anticipated. I made about 45 cookies, so they certainly weren’t too small. They were soft with only a little bit of crisp, but I wanted more flavor. 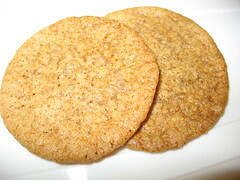 I like gingersnaps but I still haven’t found my perfect recipe yet.